Sometimes, the weight of expectation can be too much for a book to bear. 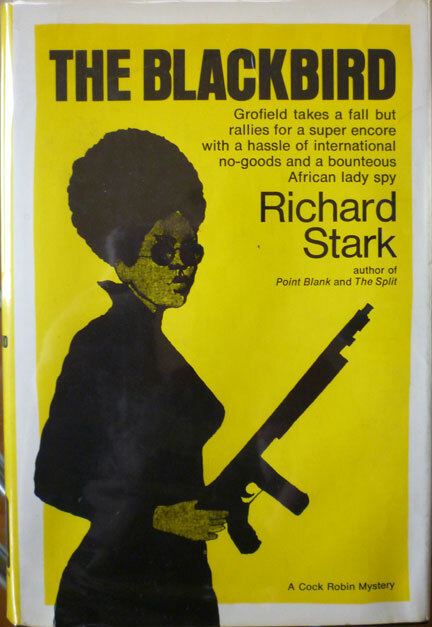 I don't think it's an accident that the Donald 'Richard Stark' Westlake novels starring career thief Parker I've enjoyed most thus far have been the less celebrated ones. While I've liked The Outfit (Parker #3, 1963), The Score (Parker #5, 1964) and The Sour Lemon Score (Parker #12, 1969) just fine, the standouts for me have been The Man with the Getaway Face (Parker #2, 1963), with its meticulously planned heist and kick-in-the-teeth ending; The Green Eagle Score (Parker #10, 1967), where we meet a parallel younger version of Parker; and perhaps my favourite so far, The Seventh (Parker #7, 1966), with its post-heist frustrations and eventual bloodbath. I think that's partly because everything I'd read about them beforehand suggested they weren't quite up there with the agreed classics of the series – which just goes to show you should never believe everything you read – but it's also their more reflective nature, the way they each show Parker in a different light: as the master planner, as he might have been as a novice, and as a man completely at fate's mercy. The flipside to that is, of course, that my enjoyment of the likes of The Outfit and The Score may have been soured slightly by expecting too much from them, although I don't know how true that is. I did like 'em, as I say; I just think there's more going on in some of the other books. 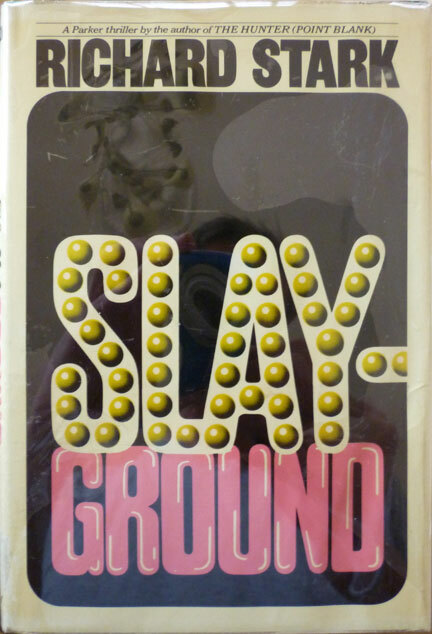 But I suspect that's almost certainly the case with Slayground. 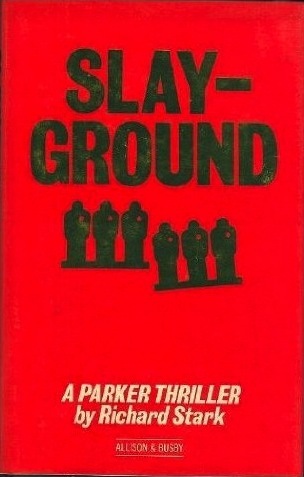 First published in 1971, the fourteenth Parker novel may well be the most venerated of all the Parkers. Something about it obviously chimes with Stark's fans – probably the way it confines Parker, traps him in a snowbound closed-for-the-winter amusement park following a disastrous getaway from a heist, beset on all sides by corrupt cops and gangsters all after his loot. But for me, while I liked it, and there were moments I really dug, on the whole, it lacked something. Perversely, I think that plot was precisely what my problem with the book was. On first inspection, Parker alone, back to the wall, living on his wits, fighting to escape a closed down funfair sounds brilliant. In practice, I found it a bit too simplistic, and therefore a bit too predictable. Because you know Parker will get out of this. I mean, you know Parker will always get out of whatever situation he's in somehow, as there's always a next book in the series (until you get to 2008's Dirty Money, that is). But usually it's more about how he'll come out the other side with some kind of reward, not whether he'll come out the other side at all. 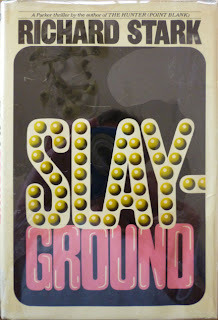 In Slayground, the money quickly becomes a secondary concern. Parker's fighting for his life. And given that, you just know, one way or another, he's going to exit through the gate he entered. That took some of the suspense out of it for me. 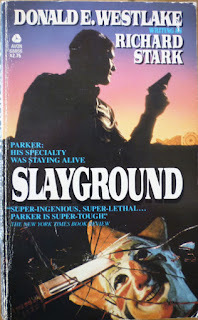 Another consequence of the plot is that Parker's on his own for most of the novel, and again, that didn't quite work for me. The whole point of Parker is he's a criminal automaton: there's little to him beyond stealing stuff. So if you spend any great amount of time alone with him in his head – as we do in Slayground – you'll quickly discover it's not a terribly interesting place to be. Despite the fact he can barely be bothered to speak to most people, Parker works best when he's interacting with other characters. I live for those moments where Parker has to deal with a horrific human situation like, y'know, actually having to speak to someone, which he generally handles by not speaking at all, because for him there's nothing to say. How he deals with, say, Alan Grofield, or Handy McKay, or Claire, helps to define him, by contrasting his utter weirdness – that taciturn blankness – with characters that are comparatively normal. "Quarter after five. Parker rode a rocket with wooden seats past suns and satellites to the end of the black-light Voyage Through the Galaxy." "Five minutes to six. Parker climbed to the bridge of the pirate ship." There's a splendid silliness to the idea of a hulking brute like Parker folded into an amusement park ride, or clambering over a pirate ship. On top of that, we get an appealing Stark Stooge in the shape of level-headed local mobster Caliato, who takes charge of the manhunt for Parker. Unfortunately he doesn't really stick around long enough, but he does provide the book's most surprisingly affecting moment. (As for the Stark Cutaway, that comes in Part Two instead of Part Three – while at only four chapters, Part Three is possibly the shortest 'Part' in all the Parkers.) And there are some great action sequences, not to mention, as Book Glutton pointed out on his blog, some interesting similarities to some other novels I've read this year, in particular J. G. Ballard's Concrete Island. So there are good things here. But more than anything, what Slayground feels like is a prelude: an opening chapter to some longer work. Which, in a way, is exactly what it is: a curtain opener for the main event, Butcher's Moon (1974), the next Parker but one, and the longest Parker of all. Parker's major nemesis in Slayground, local mob boss Lozini, is left alive at the end of the novel, so it's a pretty safe bet we'll see him again in Butcher's Moon, which details Parker's attempt to retrieve his loot. 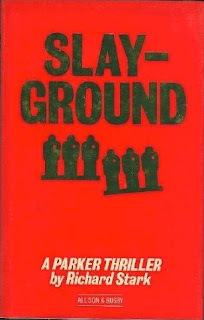 Before that though, there's Plunder Squad (1972), which is a less-celebrated Parker novel, so it'll be interesting to see how that pans out. 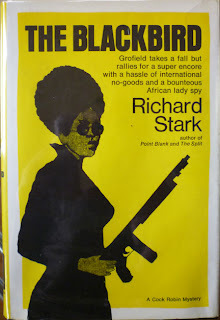 And I'll also be reading the Joe Gores novel Dead Skip (1972), which ties into Plunder Squad, and possibly the final Alan Grofield book, Lemons Never Lie (1971), before I get to Butcher's Moon. Verily, my Stark cup runneth over.